The weather window for our sail to Poland was nearly perfect. Northeast is the right direction for the wind, but it is also one of the most treacherous directions, especially for landing on the south coast of the Baltic. Fortunately there was a stationary high-pressure area over Scandinavia and the winds were so light we had to motor the first 6 hours. Soon the wind increased to 10-15 knots from the North, then Northeast. We managed to chug along at a moderate 5-6 knots for the remaining 26 hours of the trip, lowering the sails just at the entrance to the Port of Hel. Overnight an almost full moon that rose at sunset and set at sunrise accompanied us. Since there was very little cloud cover, and midsummer is past, it was good to have the moon’s light with us. All our other overnight passages this year have been with complete cloud cover / rain. Other than two huge oil platforms 50 miles offshore and the usual cargo ships, ferries and cruise ships, we had an uneventful crossing. 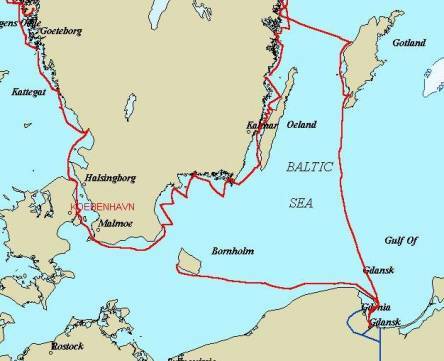 The Hel Peninsula is a very narrow crook that provides protection for the NW corner of the Gulf of Gdańsk. The spit of land is a large sand dune, and the beaches were wall-to-wall people. Hel is a major tourist area, with row after row of stalls selling cheap imported trinkets. 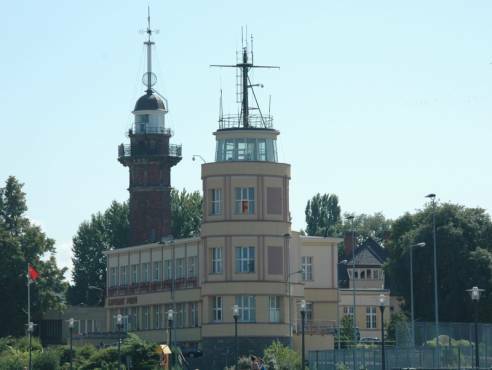 The following day we motored across the Gulf of Gdańsk to the mouth of the Vistula River and through the New Port with its historic lighthouse, constructed in 1894. 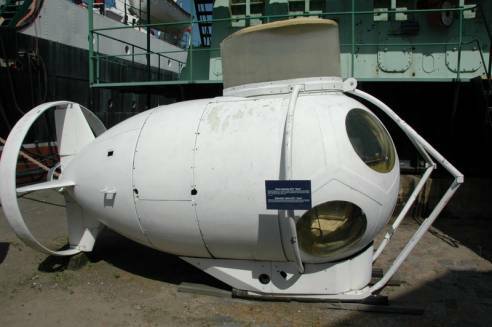 It is now a museum, but has a time ball like at Greenwich, England, that drops at noon. We motored about 3 miles up the Vinsula, then turned on to the Motława River and docked at the Gdańsk Marina. From our cockpit, we have a good view of one of the most historic medieval gates, Crane Gate. It had the largest / highest crane incorporated in it for loading and unloading boats, which made Gdańsk a popular and wealthy Baltic port in the Middle Ages. The crane was driven by huge wooden drums in which men walked / ran to raise and lower the crane. It could life two tones to a height of 27 meters. The cost of staying in the marina just outside Głowne, the heart of the city from the 15th to 19th century, was about $17/night, which included electricity, water, and wireless internet. The venue was remarkably quiet at night. 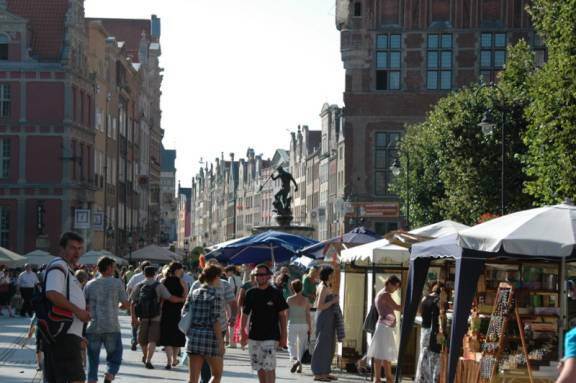 Gdańsk was in the middle of its 3-week St. Dominic’s Fair celebrations, with street theatre, concerts, and street vendors selling mainly junk. There was also a huge flea market. 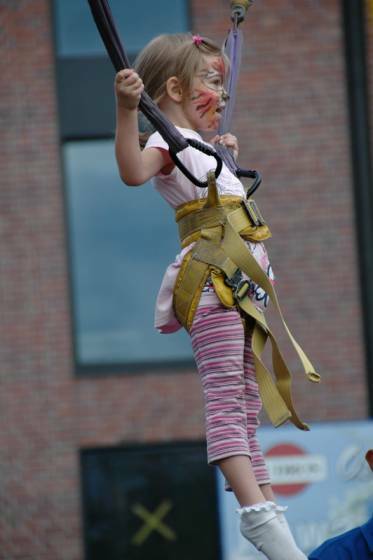 There are rides for children, trampolines, and other fair-like entertainment for the St. Dominic’s Fair. 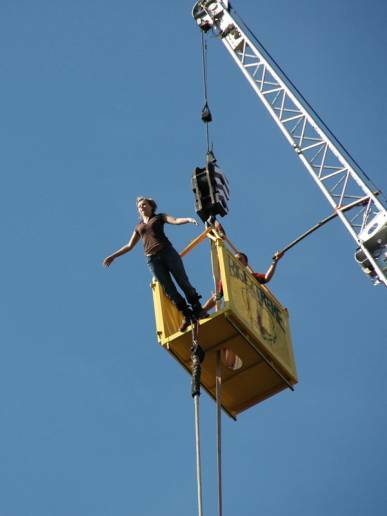 One feature is a huge crane with a bungee jump, and it is very popular. People jump both day and night. Brian has to avert his eyes because of his vertigo. He says his ears pop just looking at the picture of the free fall. The bell tower is encased in scaffolding for renovation work. There are 5 spires on the church in addition to a domed chapel. The Gothic interior vaults are adorned with many works of Medieval and Baroque art. 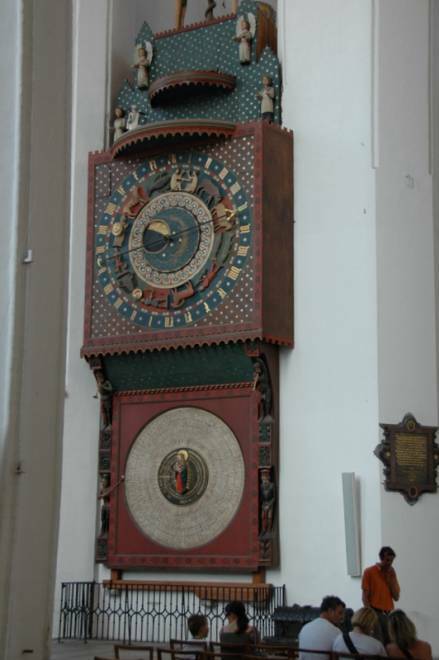 An astronomical clock built in 1464-1470 by Hans Düringer, shows the hours, days, movable feast dates and the moon phases. Saturday was the Fair’s Bread Day with around 20 booths from various bakeries and mills. There were some demonstrations, but it was mainly a display of breads in unusual shapes and designs. We bought some wheat breads and also some sweet items (chocolate, poppy seed, and individual pastries filled with a yoghurt-based (sour) artificial cream filling) and did not really like any of them. The breads and pastries are a rough texture, and almost always have a sour taste. We were unable to distinguish between the various types of bread we sampled. 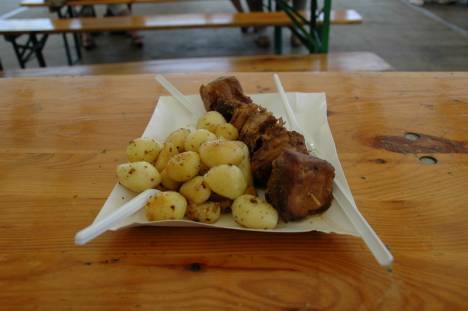 We also sampled smoked pork products, both in sausage and whole cuts of meat. We have found good chicken, but little fish and beef and no lamb. The diet is definitely pork-based when it comes to meat. There are also lots of pickles and mounds of cabbage-based salads in the street stalls. Głowne, or Main Town, is the main tourist area, and has been restored since there was heavy destruction during WWII and during the Russian “liberation”. It is now quite beautiful … with lots of Dutch / Antwerp influences. Most of the buildings have been restored to 17th and 18th century design. 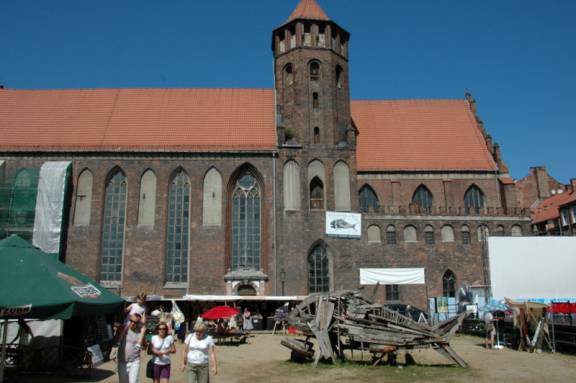 As in St. Petersburg, Gdańsk is built on a river delta, and therefore there are not many stone buildings. There is a combination of brick covered stucco (like St. Petersburg) and uncovered fancy brickwork. 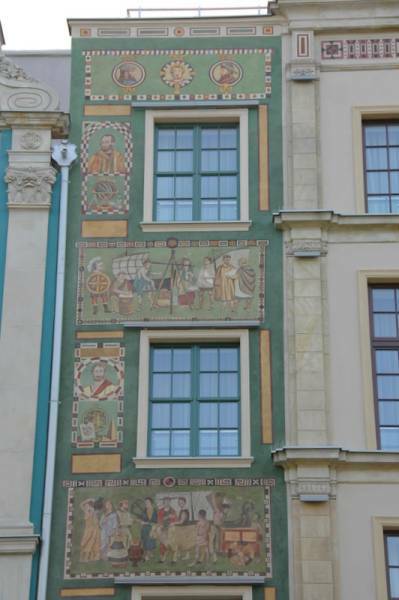 The stucco is often painted with beautiful frescos, at least on the streets where tourists take pictures. A number of buildings with arched passageways are called gates, although this is not a walled city. 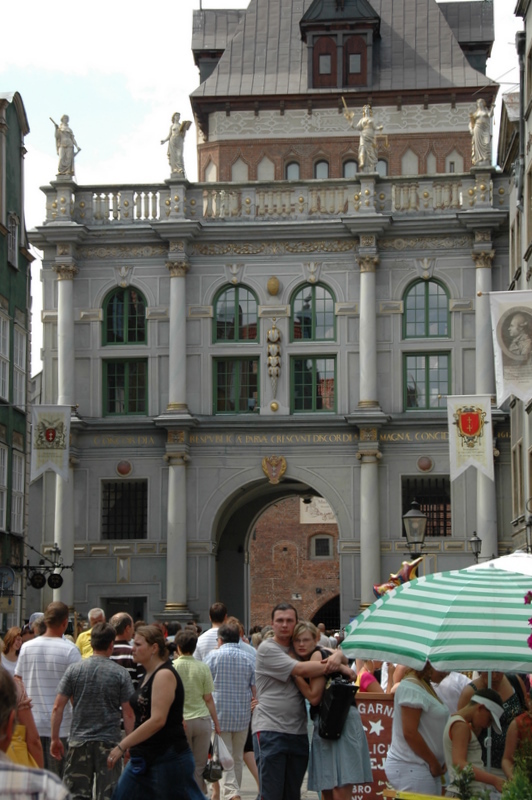 The Green Gate was our main entrance to Głowne, and houses Lech Wałęsa’s office. Golden Gate, early 17th century, reminded us of St. Petersburg with its gold and rooftop statuary. The Town Hall has a clock tower with a carillon recently reconstructed to replicate the original 17th century instrument. 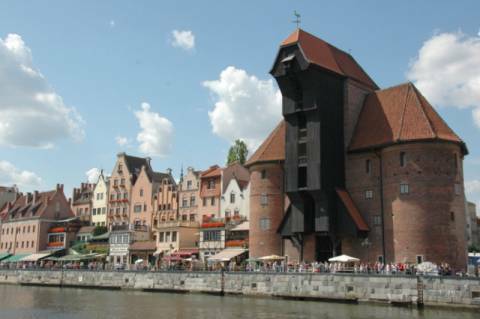 In fact, we learned there is an international carillon festival in Gdańsk each year. Neptune’s Fountain is perhaps the most photographed feature in the Long Market in Głowne. 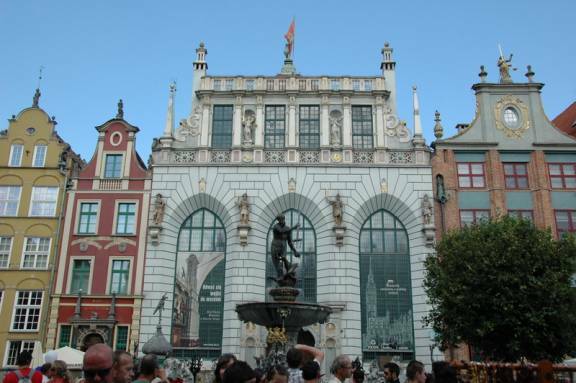 A local legend has it that Neptune was so indignant at seeing coins tossed into his fountain that he struck the water with his trident crushing the cold into tiny flakes, which since then have glittered in the famous Gdańsk liquor, Goldwasser. 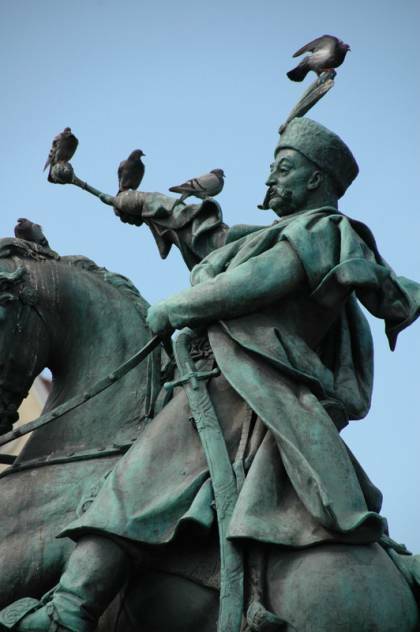 Speaking of statues, we saw the striking statue of King Jan Sobieski III. He is well described in this passage from Michael Moran’s A Country in the Moon. “European Christianity defended and indeed defined itself in constant wars against the Turks and Tartars, culminating in 1683 in the defeat of the Grand Vizier, Kara Mustafa, who was pursuing a Jihad or Holy War on the siege plains outside Vienna. The principal actor in this final Crusader battle was the Polish King Jan Sobieski III, the ultimate Samatian, born during a raging thunderstorm and Tatar raid. Fluent in half a dozen languages, richly dressed in furs and silks, silver half-moon heels to his Turkish boots and a jeweled scimitar, voluminous moustache and hair worn in the curious Sarmatian pudding basin style, he was in appearance the archetypal Polish Oriental.” p. 173. 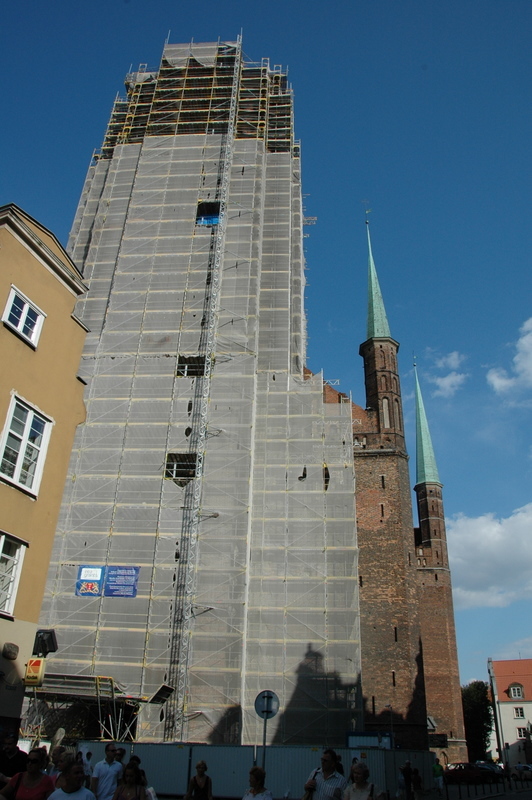 St. Nicholas Church escaped WWII unscathed, and is the oldest church in Gdańsk. 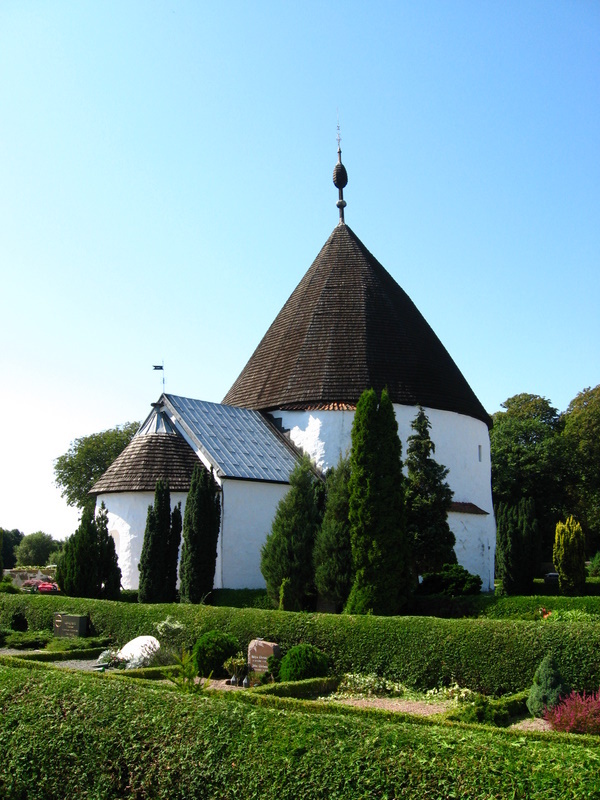 Its foundation goes back to the early 12th century. 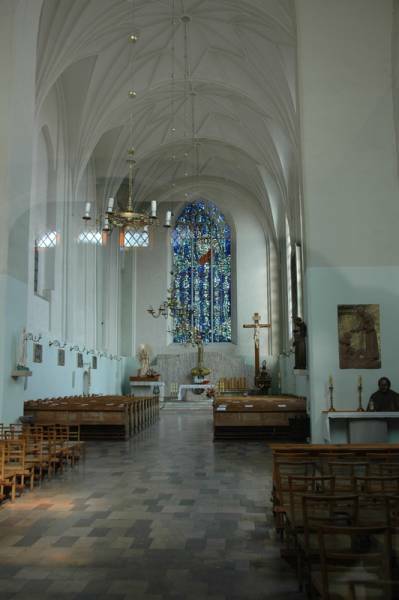 Over the centuries the church has been the domain of the Dominican Friars. In 1260 Pope Alexander IV granted the monks the privilege of holding indulgence festivities, which gave the beginning to St. Dominic fairs. 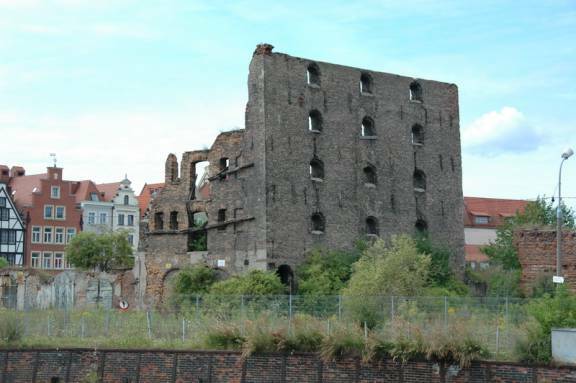 There is an island between the marina and Głowne that used to have many granaries, or warehouses. Most of these buildings have remained in ruins and are overrun with vegetation. Adjacent to Głowne is Miasto, the old town. The small area is home to four major churches: St. Joseph’s, St. Bridget’s, St. Catherine’s and St. Elizabeth’s. 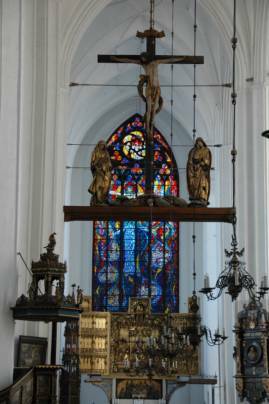 Since most of these churches suffered damage during WWII, most have modern stained glass windows. The windows in St. Joseph’s were especially lovely. The Town Hall of the Old City is now a museum and has a slender turret. 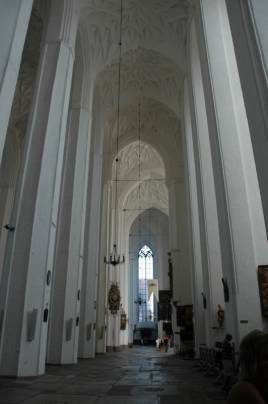 It is built in the Dutch Mannerist style. 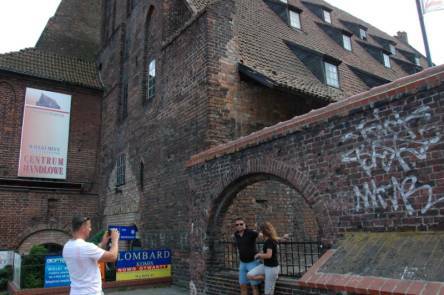 The Grand Mill on the Radunia canal with its huge gable roof was a flourmill, granary and bakery. Today it houses mainline shops, but still has the old mill wheels are display. 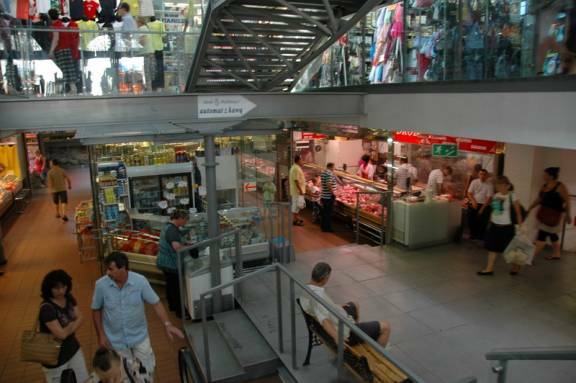 One of our favorite pastimes in new cities is to go into the food markets. There were a few large North American-style supermarkets within walking distance of the marina, but we really liked the covered market in Głowne. The main and second floors sell clothing, hardware, and the like. The basement is full of stalls selling meat, sausage, cheese, fish, breads and vegetables. We found 2 bakeries that have Challah. We were dismayed, but not surprised, that the Poles generally have not embraced other cultures and have forgotten that much of their population (and culture) used to be Jewish. There are Asian and Middle East restaurants and fast food joints, but no “foreign” alphabets on the signs. 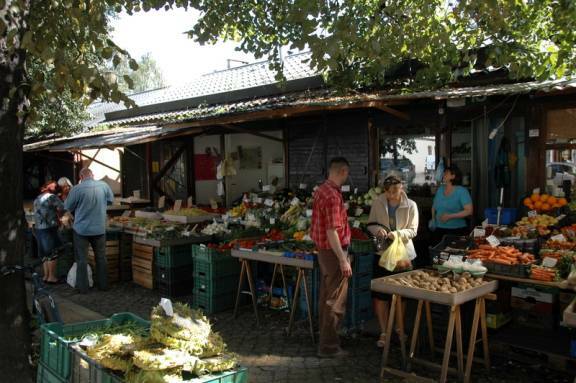 The covered market is on the site of a 12th century monastery that included a graveyard. 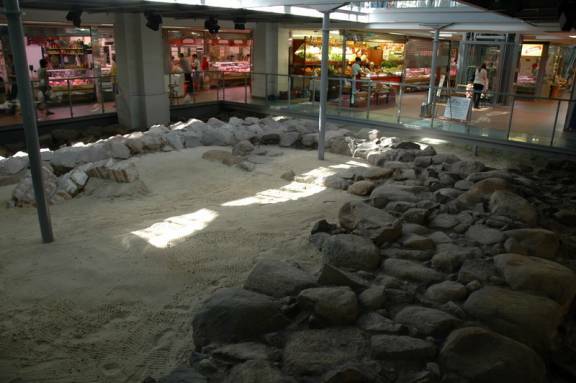 It is not only a great market, but also a major archeological site. We did not buy a sunflower. These are very popular. The sunflower with a head full of seeds, minus the pedals, is sold to people who walk along the street eating the seeds. I thought they might have been bought to hang in a garden for the birds … but no way. People love the seeds raw. No roasting, no salt. Prices are low. We bought a 1L bottle of Martini and Rossi vermouth for $12. and a half chicken costs $1.50. Beer at the fair was $1.25 for a pint glass. Bread runs around $1/loaf. Some things are very expensive: wine, coffee and mobile phone calls to North America. 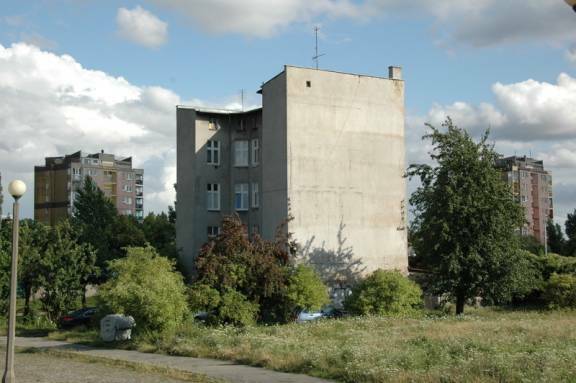 We also ventured outside of the major tourist area and saw the crumbling Soviet-era housing, the many lots (some with hoardings) that are waiting for new buildings, overgrown with vegetation, waiting for the archeologists to finish work. As with many old sites there are cities underneath the current city that only get exposed when you start to excavate. There seem to be many “dollar” stores. Life here is not easy, but we gather it is improving from the 1950’s to 1980’s when it was under the Soviet occupation. We noticed that many of the trees are Basswood and Popular, softwood trees that grow quickly. 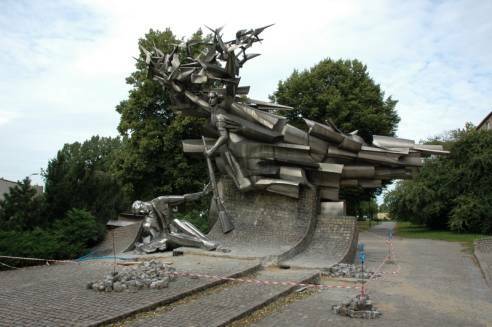 This is another indication that the city was devastated during WWII. These quick-growing trees help take the hard edge off areas that were destroyed and not reconstructed. We were in Gdańsk for the anniversary of Solidarity’s major success in assuring free elections, August 15. 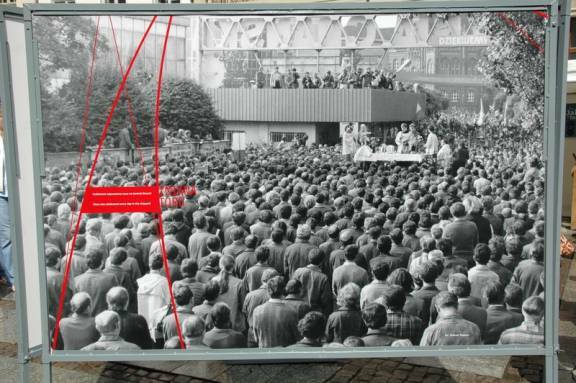 We went to the Gdańsk Shipyard, saw the memorial to fallen workers, and studied a poster display on the Solidarity actions not only in Poland but other eastern bloc countries against the soviet occupation. 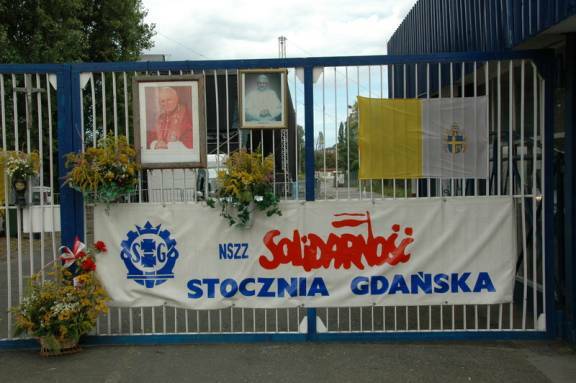 We were unaware of the strong role Pope John Paul II played in supporting and convincing the general population of the possibility of success of Solidarity. 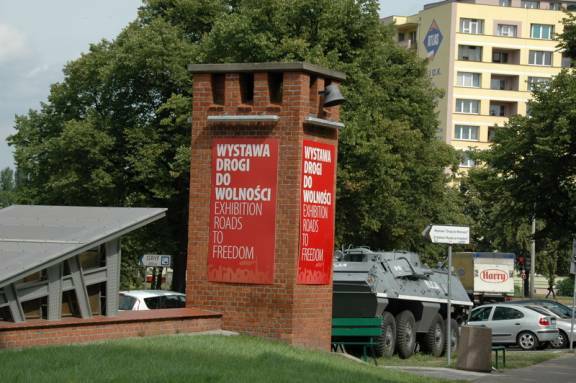 We also spent several hours at the Roads to Freedom exhibit near the Gdańsk Shipyards. It was very well done, educational and moving. 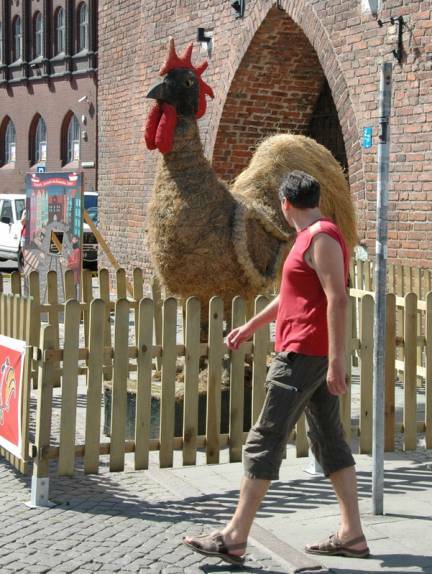 This exhibit has traveled outside Poland, and we highly recommend visiting it. Entry into a fabulous exhibit of Solidarity history … for more pictures please go to the Solidarity Photo Gallery on the Pilgrims Passages web page or click here for a direct link to the photos (use the return arrow in the browser to get back here). There was a marathon run (our second one this year, the first being in Copenhagen). 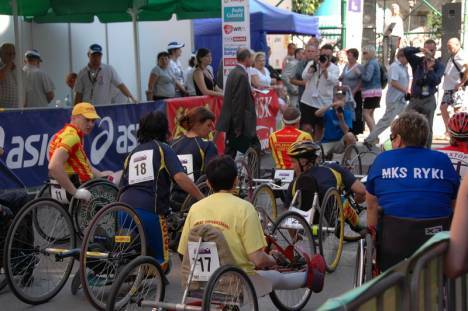 Earlier in the week there was a wheelchair marathon. We went to the Amber Museum and learned much about this resin that is so popular in the Baltic. Gdańsk is the Amber Capital of the world, so we decided to celebrate our two years in the Baltic by learning enough about it and to buy some. The Amber Road from Gdańsk to the Mediterranean via the rivers of Europe was a major trading route for amber and other commodities. The museum was housed in a tower that served as a jail and torture chamber, so in addition to learning about amber, we also learned the finer techniques of torture refined over the past few centuries. We cannot understand how human beings can be so uncaring of (and suspicious of) each other but can now appreciate the old saying “practice makes perfect” at least as far as torture goes. We really enjoyed the Maritime Museum. The displays were well done and in each room booklets in other languages were available since all of the signage was in Polish. We were surprised at two absences: first, the mention of the square-rigger training ships that Poland has maintained, even though there were several cases on maritime education. Second, that the Polish Navy stationed near the Isle of Wight in England during the 2nd World War disobeyed orders and shot down German planes attacking Cowes, thereby saving the town. 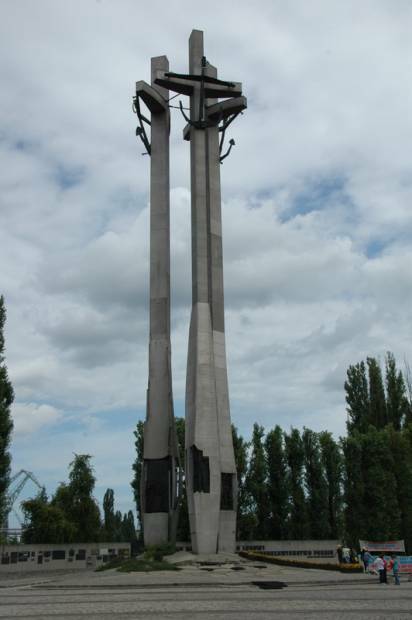 (www.absoluteastronmy.com/topics/ORP_Blyskawica) The English refused to acknowledge their indebtedness to the Poles, and the Poles have not celebrated their success in the museum. The grounds of the museum held many huge artifacts that were not labeled. It almost looked like a maritime junkyard, and was fascinating with huge engines, the bridge of some large boat with a fire nozzle, and other heavy equipment. The Archaeological Education Center was equally interesting and well done with English and Polish signage. They have done much research and work on reconstructing what people looked like in the Middle Ages based on skeletons they have retrieved. There was some of this in the Wasa Museum in Stockholm, but the whole process was well described here. One small room was devoted to Pilgrims and Medieval Pilgrimages. There were a number of badges Pilgrims received when they visited holy shrines, which were sewn onto the Pilgrim’s clothing. What was disturbing was that one small shelf had a few Jewish silver items (mezuzahs and a pointing stick), but were not labeled as Jewish. It would have been easy to assume they were just part of the Christian pilgrimage display. 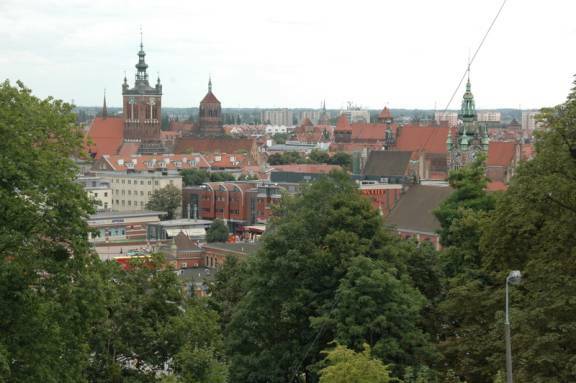 We climbed the hill on which the Millennium Cross sits (erected in 1997 to celebrate the 1000th anniversary of the city), and got a good panoramic view of the city and could see the Gulf of Gdańsk in the distance. 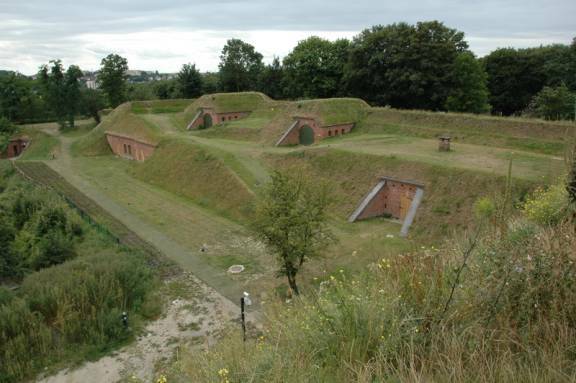 The hill was part of a huge earthworks fort, Stronghold Fort, that was fascinating, but unfortunately all the information was in Polish only. We did learn that the Russians laid siege to the fort (unsuccessful) in the 18th century, and then successfully captured by Napoleon in 1807. We also visited a small monument, the Cemetery of Lost Cemeteries, which commemorates all the burial grounds that have been lost in the city’s history. 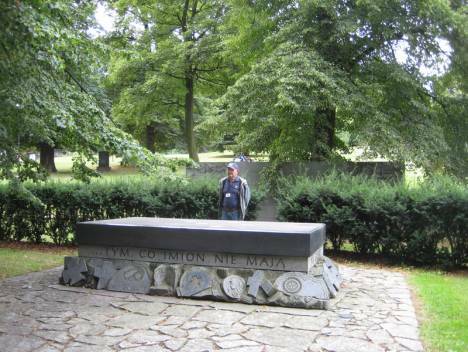 It was erected to pay respect to all those anonymous people of many faiths and nationalities who lived and died in Gdańsk. We also found the Monument to the Defenders of the Polish Post, and the Post Building. 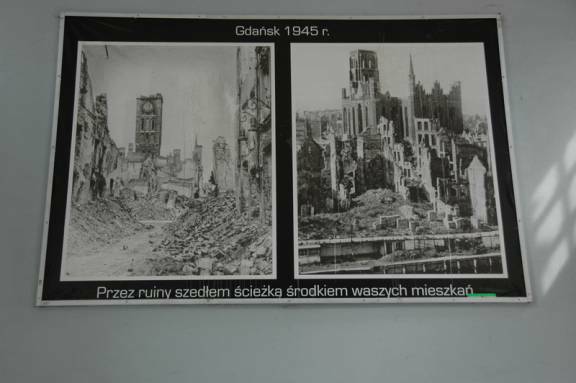 September 1939 the Nazis began their takeover of Europe with an attack on Gdańsk. 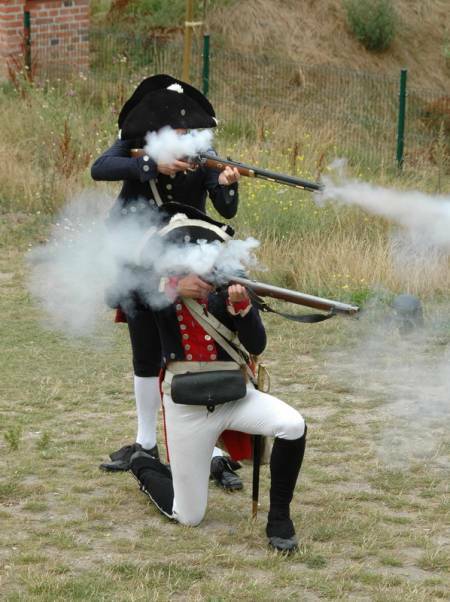 The Post Building was being used to store ammunition, and the building was fiercely defended. 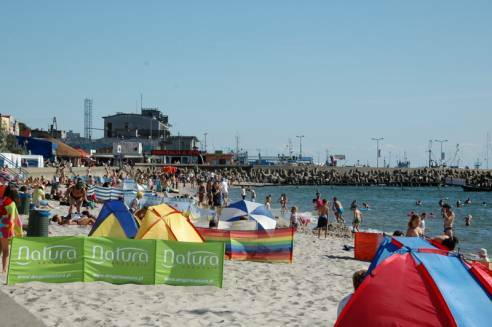 The Baltic coastline in Poland does not have any natural harbours. 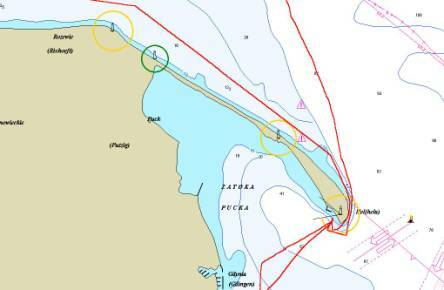 In north or northeast winds, entering and leaving the manmade fishing harbours can be dangerous or impossible. 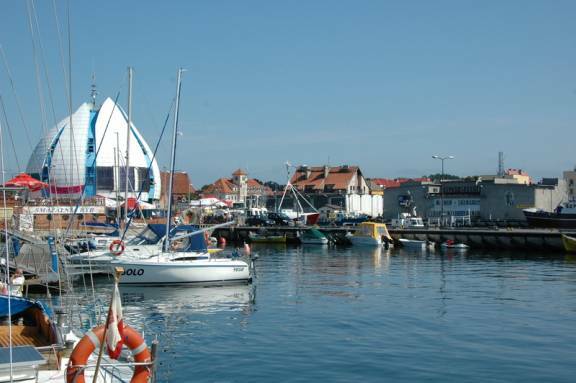 Therefore we decided to make the 160-mile overnight sail from the Gulf of Gdańsk to Bornholm, Denmark’s eastern-most island 40 miles south of the southern tip of Sweden. We wanted to make the trip with favourable winds (east, southeast, south) and so delayed our departure until a weather window opened. Our last day in Gdańsk we stopped by several stalls and shops, saying “good bye” to the people we met during our 12 day stay. We bought some more smoked salmon and some tomatoes that taste like tomatoes. 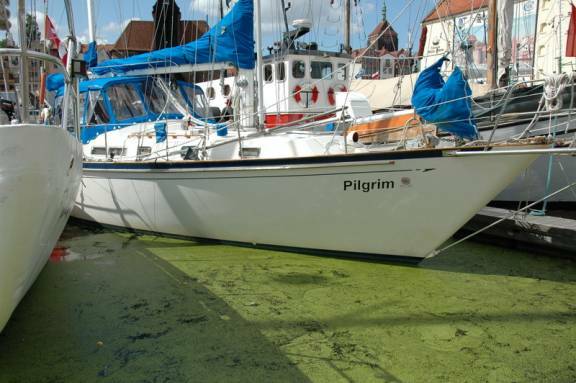 Pilgrim was sitting in a sea of duckweed at the marina and moss was growing on the rudder. We needed to move on. We no longer needed a map when we went out in Gdańsk. It has been a good visit. We have learned much about Solidarity and Amber, and have gotten to know people who are willing to attempt communication in English with a smile.